This paper presents a general modeling strategy for ambiguity resolution (AR) and position estimation (PE) using three or more phase-based ranging signals from a global navigation satellite system (GNSS). The proposed strategy will identify three best “virtual” signals to allow for more reliable AR under certain observational conditions characterized by ionospheric and tropospheric delay variability, level of phase noise and orbit accuracy. The selected virtual signals suffer from minimal or relatively low ionospheric effects, and thus are known as ionosphere-reduced virtual signals. 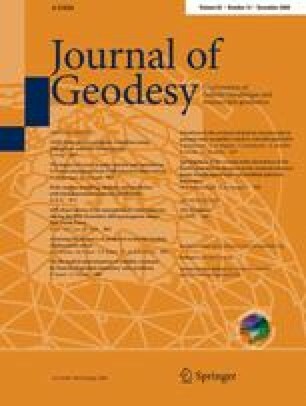 As a result, the ionospheric parameters in the geometry-based observational models can be eliminated for long baselines, typically those of length tens to hundreds of kilometres. The proposed modeling comprises three major steps. Step 1 is the geometry-free determination of the extra-widelane (EWL) formed between the two closest L-band carrier measurements, directly from the two corresponding code measurements. Step 2 forms the second EWL signal and resolves the integer ambiguity with a geometry-based estimator alone or together with the first EWL. This is followed by a procedure to correct for the first-order ionospheric delay using the two ambiguity-fixed widelane (WL) signals derived from the integer-fixed EWL signals. Step 3 finds an independent narrow-lane (NL) signal, which is used together with a refined WL to resolve NL ambiguity with geometry-based integer estimation and search algorithms. As a result, the above two AR processes performed with WL/NL and EWL/WL signals respectively, either in sequence or in parallel, can support real time kinematic (RTK) positioning over baselines of tens to hundreds of kilometres, thus enabling centimetre-to-decimentre positioning at the local, regional and even global scales in the future.